In a range of fillings. UK manufactured to fit any size of bed. 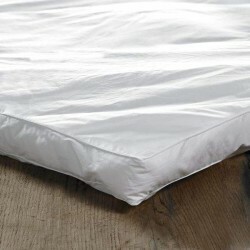 Hollow Fibre Mattress TopperDeep filled topper in non allergenic polyster filling.7cm deep topper fi..
Mattress Topper - Duck Feather & Down TopperFilled with natural feathers to aid a comfortable an..